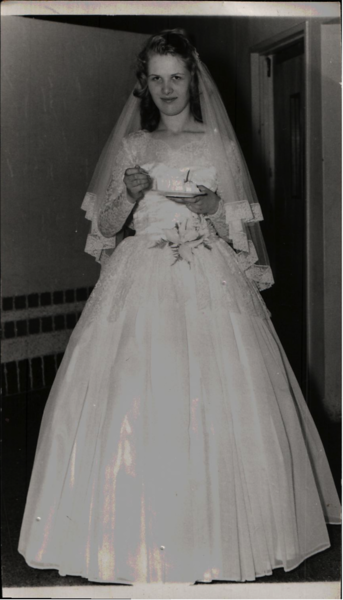 Back of photo: "Ruthie eating a piece of her own wedding cake at the reception. It was so hot and her veil had slipped but folks liked her for visiting with all the guests and not running off. In fact they came home after the wedding and had supper with 14 missionaries who stopped over to eat with us because they had come so far. Hesiekinds - he is Swedish his wife Norwegian; Anresons, both from Sweden and some single missionaries and the children of H's and A's. What a day! She had taken the two white orchids off the Bible she carried in the church and pinned them at her waist."